Please note: MF-RUNDE e.V. is sponsoring the following awards for contacts with its members after January 1st, 1982 to all licenced radioamateurs and SWL. A QSO wit the club station DLØMF is obligatory before you can apply for any of these MF-Awards. The design is an engraved brass-plate with anchor and lightning symbol on a wooden plate. The callsign is engraved. If all contacts are made in CW, an additional engraving is included, if required. 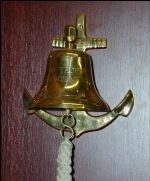 Brass shipsbell and support with callsign engraved. Quartz controlled ships clock made of brass on a wooden plate. The callsign will be engraved on a brass plate. All contacts on HF frequencies (160-10m) must be worked in either CW* or SSB exclusively. Contacts on VHF/UHF/SHF bands (above 50 MHz) are equally. For contacts with MF members 2 points in CW* and 1 point in SSB count only once for each member. MF member stations outside Europe count 6 points in CW* and 3 points in SSB. For all above mentioned awards (MF Plaque, MF Trophy and MF Supertrophy) a QSO with the club station DLØMF is obligatory. DLØMF 10 points in CW* and 5 points in SSB; all other German MF clubstations are good for 6 points in CW* and 3 points in SSB. Exception DAØUBOOT. A QSO with this special station count for all MF awards and in all modes 25 points. Contacts with MF members or with MF club stations count in both modes (CW* and SSB) for an award, e.g. the same station may be enlistet in the application for three modes. Non-German MF club stations count, for the time period before 01.01.2001, 2 points in CW* and 1 points in SSB, but after 01.01.2001 6 points in CW* and 3 points in SSB. These non-German MF club stations are credited before 01.01.2001 as well as additionally after 01.01.2001.
in digital modes, except of Packet Radio. This does however not apply to the Supertrophy. Backdated to 01.01.2009 all contacts of MF members working from home, from an europeen country or as well as from overseas counts can be assessed many times separataly with appropriate score. All regulations apply for SWLs as well. Confirmed SWL reports are equal to QSOs. 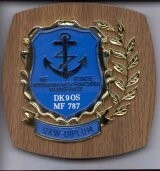 The verified points for the MF plaque class 3 (50 points) are counting for class 2 (100 points) as well. Likewise it is handled for applying class 1 (150 points) as well as for the Trophies. When applying for an award of higher grades, a contact shall not be enlisted which was already scored in a previous application, except it was made in a different mode. The steadily increasing number of MF members and the growing interest in our naval net at home and abroad gave evidence, that many HAMs were able to work more points than required for the Trophy and Supertrophy. Therefore MF-RUNDE decided crediting those HAMs for their activities. Stickers were spon-sored for raising the Trophy and Supertrophy up to 300, 350, 400, 450 and 500 points and more. The stickers are fixed on a wooden plate. New award holders are being noticed in the weekly MF bulletins and in “MF QTC”. Anchor and lightning symbol with laurel tendril on a wooden plate. The callsign is engraved. If all contacts are made in CW, an additional engraving on a small plate is included, if required. All contacts on all frequencies above 50 MHz with members of MF-RUNDE and their club stations since 01. January 1987 are credited. Each contact counts 1 point. Each contact counts only once even if worked in a different mode (FM,SSB,CW). Already credited points for the Plaque in class 3 count for the application for class 2 as well as in class 1. Contacts enlisted in former applications shall not be included in a new one again. For application procedures see section “MF Plaques, MF Trophy and MF Supertrophy” as mentioned before. 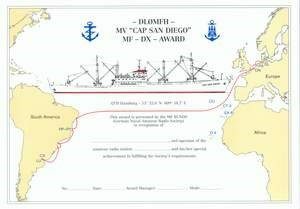 MF DX-Awards MV "CAP SAN DIEGO"
This award builds a bridge for radio amateurs between South America and Europe. Furthermore it shows the old shipping route of this vessel. To achieve this award you shall work stations in all the countries being called by this vessel on its regular route. These contacts must be made in CW, SSB, FM, which were the former communication modes of this ship. Simultaneously, a contact with the radio amateur station DLØMFH, is the connection to the MF-RUNDE. The award is a 26x19cm four colour certificate, printed on original marine chart paper. On the front page is a picture of the MV “Cap San Diego” together with the logos of the Hamburg Admirality and MF-RUNDE, furthermore it includes the Atlantic ocean and the continents of Southamerica, Africa and Europe, showing the ports of call of this vessel. On the back side of the Award is the history of this ship and some technical datas. *** as a joker for one of the Southamerican countries, a QSO with an EA8 station is accepted. 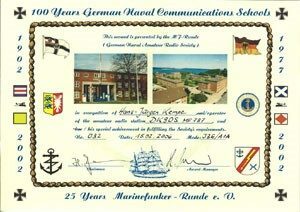 This award is issued on behalf of 25 years MF-RUNDE and 100 years Naval Communications and Signal School at Flensburg. 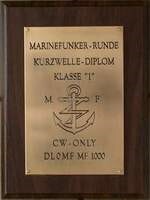 The diploma appreciates specially the good and close links to the Naval Communications and Signal school at Flensburg-Mürwick. This school was closed in 2002, after 100 years of education and training for the German Navy. Colour print on A4 size carton. The front shows flags, coats of arms and pictures of the Naval Signal School. In the back is the history of the Naval Signal School in German and English. The diploma can be applied by any licensed radio amateur, SWL or radio amateur club station. Only direct 2-way contacts after 1st of January 2002 count for this diploma. Bands: – All HF amateur radio bands including WARC bands and/or VHF, UHF amateur radio bands. All rules are accordingly valid for SWL’s. Confirmed SWL reports count adequate to QSO’s. At least 100 points must be obtained by contacts with MF club stations. Any different MF club station counts only one time regardless of the operation mode. These two stations can not be replaced by a Joker station. The club stations DAØMEL and DLØMCM and all ships radio stations of the international submarine, museum ship and light house / lightship special events (i.e. club stations without a MF number), can be counted as Joker stations for missing MF club stations. Each of these special naval club stations count only once regardless of the operation mode. Contacts with stations of MF members and with stations of other foreign naval amateur radio societies. At least 100 points must be obtained by contacts with members of MF Runde e.V. Additionally must be obtained 25 points by at least 6 contacts with members of different foreign sister naval amateur radio societies. (Here do not count Joker stations or foreign stations with MF numbers). Each of these member stations counts only once regardless of the operation mode. Each contact (with membership at more than one naval amateur radio society) counts only one membership. But other memberships (in different naval amateur radio societies) count for the same call sign if the QSOs is done on another day. This means: additional different memberships of the member station at the same day do not count. Contacts with MF member DX stations and with member DX stations of other naval amateur radio societies (means stations outside Europe) count with double points. MF-Runde issues this award to all radio amateurs and SWL. The goal is to work as many as MF club stations as possible. The award is valid from 1st of January 2018 and has an unlimited validity period. There are no band or mode restrictions. At the time there are 33 stationary clubstations with a MF No. For the award evaluation are also valid temporarily new MF clubstations, but they are valid only for the validity period of the respective call sign. 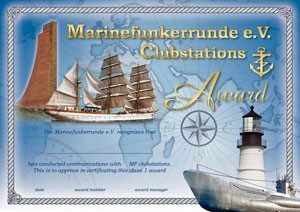 A QSO with the MF clubstation DL0MF is obligatory to appl for the award! Authorized to apply for the basic diploma in form of a DIN A4 certificate. This performance is awarded with a very nice bottleship (0,7 Ltr) of the “MV Cap San Diego”. This extraordinary performance is awarded with a very nice bottleship (0,7 Ltr) of the “SSS Gorch Fock”. The Trophy and Supertrophy are provided with an engraved brass plaque, which shows the call sign, and on request, additions, for example “CW only”. As usual for all MF Awards, there is no proof of QSOs required by sending in QSL cards. All it takes is a GCR list which includes an appropriate fair play statement. The coast liner MV IRIS-JÖRG and the harbor of Wischhafen represent a unique ensemble of the Küstenschifffahrtsmuseum, the center of the historic coastal shipping in Germany. 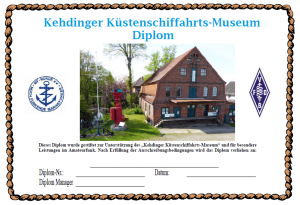 The museum collects, researches and preserves the evidence of the Historic Coastal Navigation and presents it in such a way that the significance for the Kehdingen region is recognizable. The award is valid from 1st of June2015. Bands: All HF amateur radio bands and/or VHF amateur radio bands. A QSO with the club station DL0MFM is obligatory to apply for this award. At least three additional QSOs with MF members and two additional QSOs with members of the local association Z24 must be done. In addition, the name of the museum ship IRIS-JOERG must be formed with the letters of the suffix of other stations.